From time to time even jaded tech hacks get a "wow!" moment. 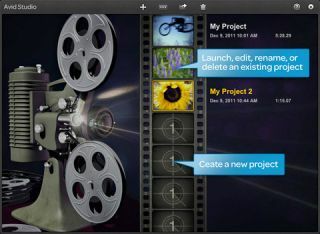 I had one last night when I saw that Avid had launched an iPad app. Avid? The high-end video and ProTools firm? An iPad app? Yep, yep and yep. Avid reckons the iPad makes a great wee video editor, and its Avid Studio plays happily with the firm's high-end desktop software. It's right, and it's not the only firm thinking along the same lines. Apple, of course, already does Garageband and iMovie, Adobe has Photoshop Touch, and there are stacks of digital audio products such as Auria and the tasty-looking Bitwig music studio. Not bad for toys, eh? What's really great about this is that we're still in the very early stages, both in terms of technology - we've gone from single core to dual core to quad core tablets already; imagine what horsepower tablets will have in five years - and in terms of what's possible for our tablets to do. Take music, for example. You can use your tablet as a quick and dirty composition device, or as a controller for a desktop music production program, or as a fully-fledged studio, or you can slot it into another bit of hardware such as Behringer's utterly brilliant/completely demented iAxe or its faintly frightening iPad mixers. This isn't about whether tablets are better than PCs or vice-versa; it's about people, and what they can do, and the ever-expanding universe of possibilities today's technology delivers and tomorrow's promises. We've only had iPad-y tablets for two years. What on earth will we be doing with them in ten?